Cambria is one of many great examples of someone who channeled an early experience with CLP into a thriving part of her classroom. She participated in Mock Trial while in high school, enjoying the experience of teamwork and competition. Memories of that program inspired her into finding ways to make her classroom as engaging as possible. In 2014, she met with CLP Executive Director Marilyn Cover to discuss how she could revive the dormant Mock Trial program at Ashland high. 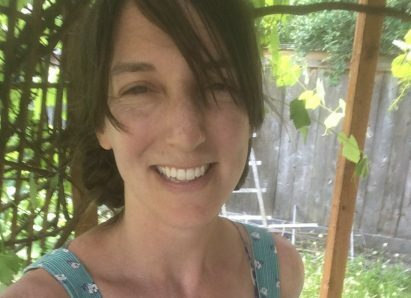 The conversation led her into professional development opportunities as well, and she’s benefited from attendace at the Oregon Civics Conference and Summer Institute. Along the way, she’s begun incorporating mock trial into her classroom. As she gets ready to rebuild the Mock Trial team, she’s also looking into incorporating We the People hearings into her teaching. It’s that first experience however, that really motivates her. I was inspired by Mock Trial when I was a teen. It engaged me and my faculties in a way that nothing else did. I became part of a team, doing high level critical thinking and public speaking about matters of law and justice. It stuck with me all these years, and now I am finally a mock trial coach and incorporate the content into my teaching of Government. All students LOVE Mock Trial. There isn’t a single one who doesn’t come out feeling accomplished and proud of themselves. Even the ones who are reticent, or maybe a little shy, to begin with feel a great sense of “coming into their power” throughout the course of our simulation. I am always speechless with pride. It’s a bonding experience for them with their peers, too. They dress up in suits, and act like adults doing high-level thinking and applications of law in front of others. There has not been one student with an IEP or disability that hasn’t also thrived with their peers in Mock Trial. I really value the authenticity of this experience for my students..
It’s very exciting. This is hands-down my favorite stuff! It makes me want to go on being a teacher each school day!